The shoulder joint (glenohumeral joint) is a ball and socket joint between the scapula and the humerus. It is the major joint connecting the upper limb to the trunk. It is one of the most mobile joints in the human body, at the cost of joint stability. In this article, we shall look at the anatomy of the shoulder joint and its important clinical correlations. The shoulder joint is formed by the articulation of the head of the humerus with the glenoid cavity (or fossa) of the scapula. This gives rise to the alternate name for the shoulder joint – the glenohumeral joint. Like most synovial joints, the articulating surfaces are covered with hyaline cartilage. The head of the humerus is much larger than the glenoid fossa, giving the joint a wide range of movement at the cost of inherent instability. To reduce the disproportion in surfaces, the glenoid fossa is deepened by a fibrocartilage rim, called the glenoid labrum. The joint capsule is a fibrous sheath which encloses the structures of the joint. Fig 1.0 – The articulating surfaces of the shoulder joint. It extends from the anatomical neck of the humerus to the border or ‘rim’ of the glenoid fossa. The joint capsule is lax, permitting greater mobility (particularly abduction). The synovial membrane lines the inner surface of the joint capsule, and produces synovial fluid to reduce friction between the articular surfaces. To reduce friction in the shoulder joint, several synovial bursae are present. A bursa is a synovial fluid filled sac, which acts as a cushion between tendons and other joint structures. Subacromial – located deep to the deltoid and acromion, and superficial to the supraspinatus tendon and joint capsule. The subacromial bursa reduces friction beneath the deltoid, promoting free motion of the rotator cuff tendons. Subacromial bursitis (i.e. inflammation of the bursa) can be a cause of shoulder pain. Subscapular – located between the subscapularis tendon and the scapula. It reduces wear and tear on the tendon during movement at the shoulder joint. There are other minor bursae present between the tendons of the muscles around the joint, but this is beyond the scope of this article. 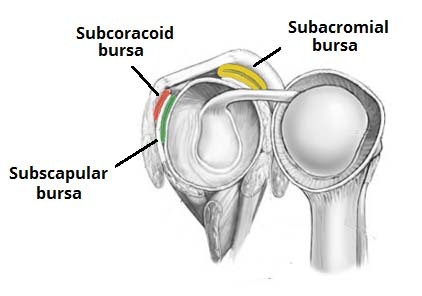 Fig 1.1 – The major bursae of the shoulder joint. In the shoulder joint, the ligaments play a key role in stabilising the bony structures. Glenohumeral ligaments (superior, middle and inferior) – the joint capsule is formed by this group of ligaments connecting the humerus to the glenoid fossa. They are the main source of stability for the shoulder, holding it in place and preventing it from dislocating anteriorly. They act to stabilise the anterior aspect of the joint. Coracohumeral ligament – attaches the base of the coracoid process to the greater tubercle of the humerus. It supports the superior part of the joint capsule. Coraco–clavicular ligament – composed of the trapezoid and conoid ligaments and runs from the clavicle to the coracoid process of the scapula. They work alongside the acromioclavicular ligament to maintain the alignment of the clavicle in relation to the scapula. They have significant strength but large forces (e.g. after a high energy fall) can rupture these ligaments as part of an acromio-clavicular joint (ACJ) injury. In severe ACJ injury, the coraco-clavicular ligaments may require surgical repair. 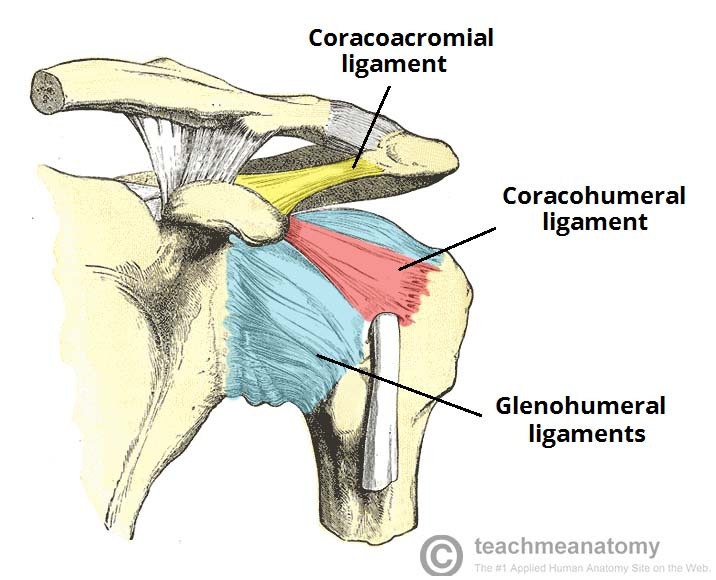 The other major ligament is the coracoacromial ligament. Running between the acromion and coracoid process of the scapula it forms the coraco-acromial arch. This structure overlies the shoulder joint, preventing superior displacement of the humeral head. Extension (upper limb backwards in sagittal plane) – posterior deltoid, latissimus dorsi and teres major. Flexion (upper limb forwards in sagittal plane) – pectoralis major, anterior deltoid and coracobrachialis. Biceps brachii weakly assists in forward flexion. The first 0-15 degrees of abduction is produced by the supraspinatus. The middle fibres of the deltoid are responsible for the next 15-90 degrees. Past 90 degrees, the scapula needs to be rotated to achieve abduction – that is carried out by the trapezius and serratus anterior. Adduction (upper limb towards midline in coronal plane) – pectoralis major, latissimus dorsi and teres major. Internal rotation (rotation towards the midline, so that the thumb is pointing medially) – subscapularis, pectoralis major, latissimus dorsi, teres major and anterior deltoid. External rotation (rotation away from the midline, so that the thumb is pointing laterally) – infraspinatus and teres minor. The shoulder joint is one of the most mobile in the body, at the expense of stability. Here, we shall consider the factors the permit movement, and those that contribute towards joint structure. Type of joint – ball and socket joint. Bony surfaces – shallow glenoid cavity and large humeral head – there is a 1:4 disproportion in surfaces. A commonly used analogy is the golf ball and tee. Inherent laxity of the joint capsule. Rotator cuff muscles – surround the shoulder joint, attaching to the tuberosities of the humerus, whilst also fusing with the joint capsule. The resting tone of these muscles act to compress the humeral head into the glenoid cavity. Glenoid labrum – a fibrocartilaginous ridge surrounding the glenoid cavity. It deepens the cavity and creates a seal with the head of humerus, reducing the risk of dislocation. Ligaments – act to reinforce the joint capsule, and form the coraco-acromial arch. Biceps tendon – it acts as a minor humeral head depressor, thereby contributing to stability. Fig 1.3 – The rotator cuff muscles, which act to stabilise the shoulder joint. The shoulder joint is supplied by the anterior and posterior circumflex humeral arteries, which are both branches of the axillary artery. Branches of the suprascapular artery, a branch of the thyrocervical trunk, also contribute. Innervation is provided by the axillary, suprascapular and lateral pectoral nerves. 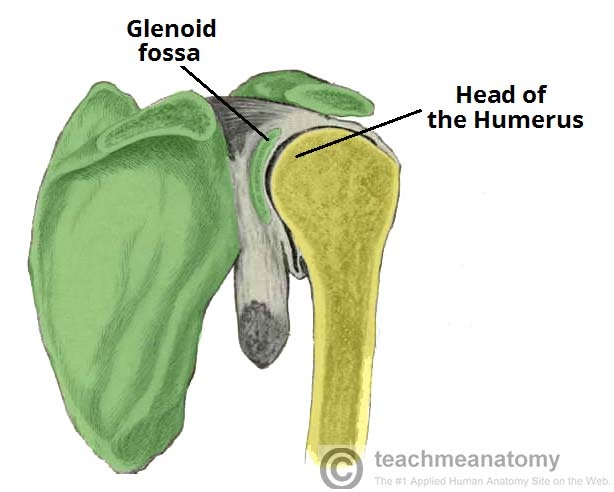 Clinically, dislocations at the shoulder are described by where the humeral head lies in relation to the glenoid fossa. Anterior dislocations are the most prevalent (95%), although posterior (4%) and inferior (1%) dislocations can sometimes occur. Superior displacement of the humeral head is prevented by the coraco-acromial arch. An anterior dislocation is usually caused by excessive extension and lateral rotation of the humerus. The humeral head is forced anteriorly and inferiorly – into the weakest part of the joint capsule. Tearing of the joint capsule is associated with an increased risk of future dislocations. Hill-Sachs lesions (impaction fracture of posterolateral humeral head against anteroinferior glenoid) and Bankart lesions (detachment of antero-inferior labrum with or without an avulsion fracture) can also occur following anterior dislocation. Indeed, so-called ‘reverse Hill-Sachs lesions’ (impaction fracture of anteromedial humeral head) and ‘reverse Bankart lesions’ (detachment of posteroinferior labrum) can be seen in posterior dislocations. The axillary nerve runs in close proximity to the shoulder joint and around the surgical neck of the humerus, and so it can be damaged in the dislocation or with attempted reduction. Injury to the axillary nerve causes paralysis of the deltoid, and loss of sensation over regimental badge area. Fig 1.4 – Anterior dislocation of the shoulder joint. The rotator cuff muscles have a very important role in stabilising the glenohumeral joint. They are often under heavy strain, and therefore injuries of these muscles are relatively common. The spectrum of rotator cuff pathology comprises tendinitis, shoulder impingement and sub-acromial bursitis. Tendinitis refers to inflammation of the muscle tendons – usually due to overuse. Over time, this causes degenerative changes in the subacromial bursa and the supraspinatus tendon, potentially causing bursitis and impingement. The characteristic sign of supraspinatus tendinitis is the ‘painful arc’ – pain in the middle of abduction between 60-120 degrees, where the affected area comes into contact with the acromion. This sign may also suggest a partial tear of supraspinatus. Which letter in the graphic represents the coracohumeral ligament? 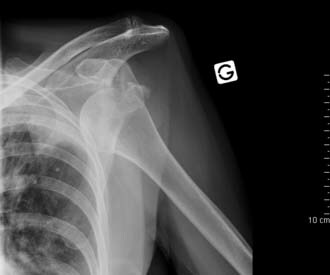 What is the most common direction of dislocation of the shoulder joint? 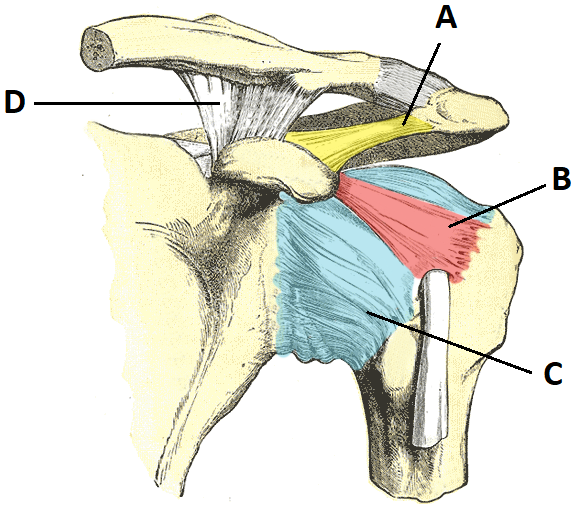 Which major ligament of the shoulder is not a thickening of the joint capsule?